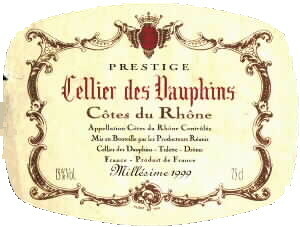 I like my Cotes du Rhone to be fruity and exuberant and this wine failed a little on that front. It is darker and hevier than most of its brothers. That does not necessarily make it a poor wine just that the contents re not what you might have been expecting. It was a well composed wine with no bad points but also, with no special charms. Pour a glass and it is nice enough but you will not remember it a day later. The Celestin Planchon 2000 Rhone is on sale in the same shop for less money and it is a marginally better wine.